People with Alzheimer's and other dementias find communication difficult; both in their effort to express thoughts and in their ability to understand others. Go into a conversation with a better understanding of how to make it more comfortable for them as well as yourself. Don’t ask questions about past events. 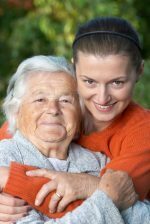 Arista Home Care offers multiple services for our clients with Alzheimer's or other forms of dementia. Our caregivers are carefully trained specifically to understand the difficulties surrounding dementia and are always willing to go the extra mile to help in times of need. Please contact us today to inquire about our in home care services.